The House Intelligence Committee voted today to turn over all of its Trump-Russia transcripts to Special Counsel Robert Mueller, so he can bring charges accordingly. Jeff Sessions is one of them. This is only problematic for the people who actually lied, but there is specific reason to expect that he’s about to get rung up for perjury – if he hasn’t secretly cut a plea deal already. We all recall Jeff Sessions famously committing perjury during his Senate confirmation hearings and then recusing himself from the Trump-Russia investigation after he got caught, but that’s only half the story. Even after getting caught, Sessions apparently committed perjury again when he testified to the House Judiciary Committee a few months later. This man is a serial perjurer, so it’s a safe bet that he also committed perjury when he testified before the House Intel Committee. So now what? Jeff Sessions is a unique case for a few reasons. He was the first person in the Trump-Russia scandal to admit his de facto guilt when he recused himself. In the process he sent an unmistakable signal that he was more interested in protecting himself than he was in protecting Donald Trump. We don’t know if Jeff Sessions cut a plea deal with Robert Mueller after his recusal, or after Donald Trump ultimately fired him nearly two years later. But if Sessions hasn’t cut a deal and hasn’t been cooperating, and if the serial perjurer did lie to the House Intel Committee, then it’s nearly a given that Mueller will ring Sessions up for perjury in order to force him to cut a deal against Trump. 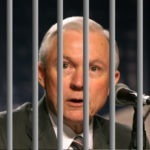 Sessions is either going to help send Trump to prison, or he’s going to prison himself.